It was really beautiful to see so many people who wanted to learn more about combining Python with LoRaWAN technology. 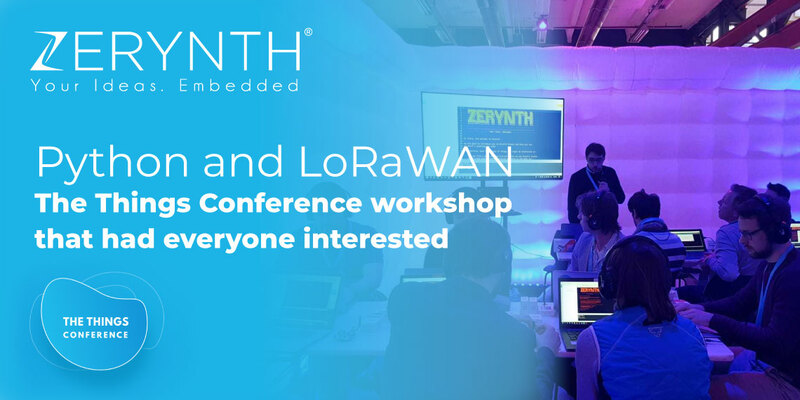 The official title of our workshop at The Things Conference 2019 was Python and LoRaWAN: from “Hello World” to professional IoT applications. It was held on the second day of the conference, Friday, February 1st. If you were one of the lucky people who attended it, you can find yourself in the images from the workshop above. There were so many things to say, and despite the lack of available time, the main concepts were exposed. For those who want to redo or deepen their knowledge, here are the slides we presented, with the necessary links to replicate all the tutorials. During the workshop, we showed people how to develop LoRaWAN-based Industrial IoT applications using Python on 32-bit microcontrollers. More precisely, we used Zerynth Studio, the XinaBox IoT development kit, and the 4ZeroBox. It was open to anyone with a bit of LoRaWAN knowledge – engineers, programmers, designers, and IoT professionals. If you want to see more Zerynth demos in action, join us at this year’s Embedded World. From the 26th until the 28th of February, in Nuremberg, Germany. We’ll be hosted by the RS Components, at their stand – Hall 3A, booth 439.